Tanyresgair Cottages01974 251517work Self-cateringTanyresgair Cottages are two self-catering holiday cottages set in a stunning location in mid Wales, on the smallholding Tanyresgair. The 170 year old stone barn at Tanyresgair has been converted into two beautifully comfortable and spacious one bedroom cottages. The cottages retain the charm and character of the original stone barn, with exposed beams, stone walls, wooden and slate floors - an ideal choice for the discerning couple who want peace & quiet at their accommodation but with lots of things to do within easy reach. Both cottages provide luxury self-catering accommodation for 2 people in an open-plan design with each having its own unique character, private access away from owners with plenty of parking, private patio with garden furniture to sit and enjoy the view. The Hayloft (sleeps 2) has a large lounge/diner with an open-plan kitchen and a shower-room on the ground floor, and a large bedroom with a king-sized bed upstairs on a mezzanine floor – in the old hayloft. The Stables (sleeps 2) is the old stables/cowshed and is open to the high rafters with the original A-frames exposed. It consists of a very large completely open-plan bedroom/lounge/diner and an open plan kitchen on a separate level, with a shower room. These cosy cottages are ideal for a romantic 'couples only' getaway - you won't be disturbed by other people's kids and you have total privacy. The luxurious king-sized bed has hotel quality Egyptian cotton and we provide large white fluffy towels. Here is what some of our previous visitors had to say: "Perfect quiet getaway for two" "Highly recommend for a romantic break" "A must for people wanting peace & quiet" "Exceptional and lovely retreat" "It was like a dream cottage" "Fabulous find for two" "You will not find a better place to kick back & relax"
Your hosts are avid birdwatchers and nature lovers and can advise you on the best places to go. For instance: Red-kite feeding at Nant-yr-Arian; Bird-watching at Cors Caron; RSPB Ynys-Hir; Dyfi Osprey Project; Dolphin and seabird boat tours from New Quay; Coarse and line fishing 1 mile away at Fron Farm Fishery Or just walk around the property and watch the Red Kites, Buzzards, Ravens and Kestrels soaring overhead. And sit by the wildlife pond in the garden and lookout for dragon-flies and tadpoles. Getting back to nature is what these cottages are all about. They are in a remote rural location with no neighbours for miles around with spectacular views. No noise or light pollution and walk for miles from your cottage across common land to a lake and trig point. Cycle friendly with bikes available for visitors and bike storage, cleaning and maintenance on hand if you bring your own. Cycle trail maps available. Cors Caron nature reserve near Tregaron within easy reach. Tanyresgair is a 14 acre smallholding right in the middle of Ceredigion – between the Cardigan Bay coast to the west and the Cambrian Mountains to the east; and between Aberystwyth to the north and Lampeter to the south. Tanyresgair Cottages provide an ideal base for many walking, cycling and wildlife watching adventures; as well as being conveniently located to enjoy all the tourism opportunities that Ceredigion, Cardigan Bay and the Cambrian Mountains have to offer. 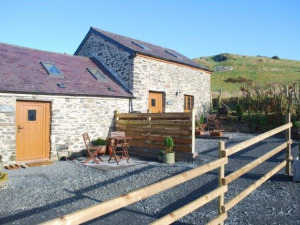 Tanyresgair Cottages are two self-catering holiday cottages set in a stunning location in mid Wales, on the smallholding Tanyresgair. NOTE: Tanyresgair take bookings for a minimum of 3 nights from Mar-Nov, except Jul-Aug when the minimum is 4 nights and are closed from Dec-Feb.
Children welcome from age 18. 6 miles from Tregaron, 12 miles from Aberaeron and 14 miles from Aberystwyth. The nearest village is Bronant on the A485, and the property is at the end of a private road. Note: SatNavs cannot direct you all the way as 6 properties share the same post code. •	Then take the next Council maintained ‘No Through’ road to the right.